Indoor air quality is critical to the health and well being of your household. Here at Purl’s Sheet Metal & Air Conditioning, we have multiple filter options to fit your needs and budget. Check out this video for descriptions on three of the available options and give us a call today to get your filters changed! Fresno CA Air Conditioning FAQ: What Does The “Whole-Home” Approach To Home Efficiency Involve? Ensuring that your home is cultivating the most efficient approach to its energy usage is a great way to reduce your utility bills and to reduce your environmental impact. There are steps you can take that do not involve massive renovations to your existing home. As we approach the summer and the peak usage times of our cooling systems, it’s important to take stock of the ways we can improve our current air conditioners. For more information about energy efficiency and your air conditioner, call the Fresno CA air conditioning experts at Purl’s Sheet Metal & Air Conditioning today! Air conditioning replacement. Whatever type of AC you currently have, if it is over 10 years old or requires frequent repairs, it may be a good time to consider replacing it with a high-energy efficiency model. Professional air conditioning installation can allow you to improve the way your home uses energy on a daily basis. Today’s air conditioners and heat pumps have SEER ratings (Seasonal Energy Efficiency Ratio) over 20, which makes them substantially more efficient than models produced just a decade ago. Ductless mini split air conditioning systems can offer SEER ratings of up to 26. While there are other factors involved in the whole-home approach, such upgrades can provide significant energy savings. Duct cleaning and sealing. If you have a forced air distribution system, then you rely on ductwork to deliver cool air throughout your home. Unfortunately, over time your ducts can accumulate debris and develop cracks and loose connections. Professional duct cleaning and duct sealing are excellent ways to improve your whole-home energy efficiency, by eliminating costly leaks and obstructions. Install a programmable thermostat. The EPA estimates that a programmable thermostat may save you up to $180 every year on your energy bill. If you have a conventional model, then consider upgrading it, so that you can customize your indoor climate, as well save energy when your home is unoccupied. For more information about our whole-home approach to your energy efficiency, whether you’re interested in a new air conditioning system, ductwork improvements, or need a complete residential HVAC solution. For more information about your Fresno, CA air conditioning, contact Purl’s Sheet Metal & Air Conditioning today! Posted in Air Conditioning | Comments Off on Fresno CA Air Conditioning FAQ: What Does The “Whole-Home” Approach To Home Efficiency Involve? Whether you have a central split, heat pump, or ductless mini split air conditioning system, it will need professional repair at some point in its life. Even if you received excellent installation and routine maintenance, repairs are inevitable. There are a lot of factors to consider when evaluating an air conditioner for repair, not the least of which is separating the problem from the root cause of the problem. You need to make sure that all AC repairs are handled by qualified Fresno air conditioning professionals in order to make sure that your air conditioner continues to run effectively and efficiently. 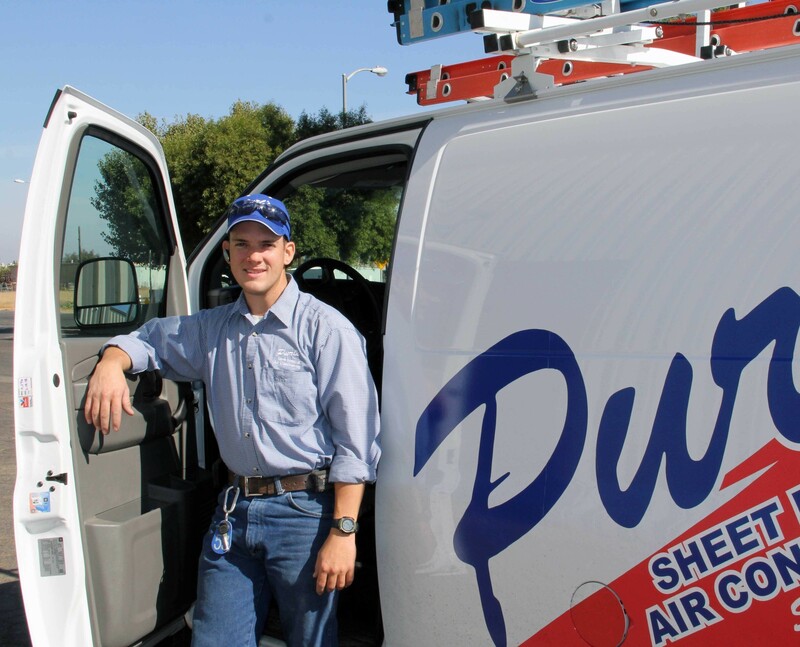 For Fresno, CA air conditioning repair, call Purl’s Sheet Metal & Air Conditioning today! AC short cycling. If your AC turns on and off frequently, that’s known as “short-cycling”. It can occur for several different reasons, one of which is that your air conditioner is too large for your living space. When the size of the AC overpowers the size of the living space, it tends to turn on and off again. It may also become excessively or unevenly cold in your home. Another cause of short-cycling is due to an electrical problem with the blower motor that sends cool air out of the air handler. Refrigerant leak. Your system requires an appropriate amount of refrigerant at all times. If a section of the refrigerant line or one of the coils has become damaged, refrigerant may begin to leak. This disrupts the entire refrigerant cycle, which depends upon pressurized movement between the coils, the expansion valve, and the compressor. It can lead to inadequate cooling. Thermostat fault. You thermostat is the user interface of your cooling system. It’s responsible for communicating the setpoint (your desired temperature) to your air handler and sensing the temperature inside the home. Much depends upon the effective operation of the thermostat, so if it becomes damaged, or isn’t calibrated properly, it can cause your AC to short-cycle, to fail to operate, and inadequately cooling. For more information about what you should look out for this spring as you prepare your AC for the summer, make sure you contact the Fresno, CA air conditioning repair experts at Purl’s Sheet Metal & Air Conditioning today!